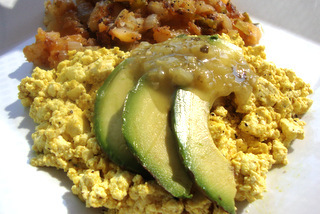 When preparing tofu scrambles, achieving the ideal balance of color and flavor can often be tricky. This blend will alleviate the guesswork for you; and if you prepare tofu scrambles frequently, then this seasoning blend will be a timesaver in your morning breakfast routine. This recipe yields ¾ cup of seasoning powder which will season about 16 blocks of tofu. For each 14 oz. block of water-packed tofu, use 2 and ¼ teaspoons seasoning; or use the recipe for the basic tofu scramble (recipe follows). Place the ingredients in a DRY food processor or blender and process until a fine powder is achieved. Store the seasoning blend in an airtight container in your pantry until ready to use. Use the powder within 6 months. * I personally recommend soft to medium water-packed tofu for the best scramble texture. Drain and press the tofu until it is not releasing any more liquid. Crumble the tofu into a mixing bowl, sprinkle in the seasoning and toss thoroughly to blend. Avoid mashing the tofu. Melt the butter or margarine in a skillet over medium heat. Do not let the butter brown. Add the seasoned tofu and “scramble” (push and fold the mixture with a spatula) until the tofu is heated through and resembles scrambled eggs. Season the scramble with pepper to taste (and add additional salt as desired). Serve immediately. Powered by Karma. ©2012-2019 The Gentle Chef | A Loving Cooperative Project.